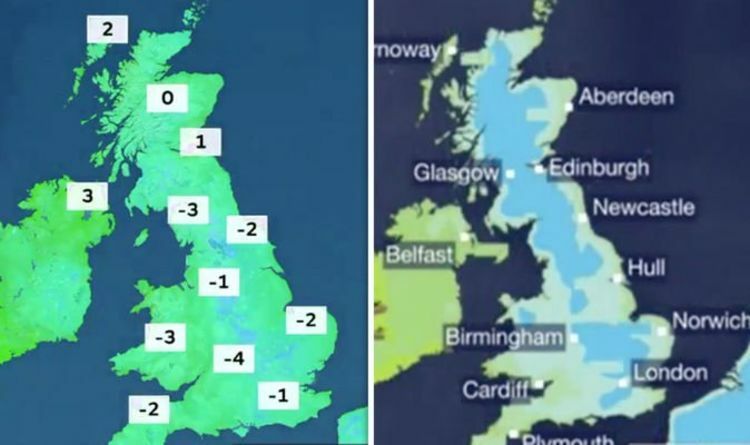 BBC’s Sarah Keith-Lucas forecasted that temperatures would be “below freezing” overnight on Saturday as the UK braces for the cold snap. The UK will remain relatively dry for most parts of the country but the cold temperatures will be felt despite the sunshine. She began by saying: “We have got weather fronts out in the Atlantic but it is this big area of high pressure across Scandinavia that is really winning out and keeping our weather dry and settled over the next few days. “But it will also be drawing in quite a cold easterly breeze. The BBC presenter added that the cold temperatures will be felt particularly between anywhere from Aberdeenshire down towards Kent in the east. She noted that there are chances of showers in the east but most areas will remain dry. She continued: “Temperatures are going to struggle with the strength of that easterly wind on Friday especially in the east. “They are going to be only around seven to nine degrees. “Through this evening and overnight into Saturday we have got some of that cloud drifting a bit further west perhaps a few isolated showers. “Another really cold night out there even in our towns and some of our cities the temperatures could be just below freezing and colder than that in the countryside first thing. The BBC Weather presenter then went on to explain that as the weekend begins there will be low pressure to the west of the UK in the Atlantic and high pressure to the east of the nation. She added that the high pressure from Scandinavia wins out over the two and brings a chilly easterly wind. She continued: “In that sunshine, there won’t be a lot to raise those temperatures. “By the time we get to Sunday, we have got a western weather front to make it breezier and cloudier.